The idea of the tough-as-nails catcher who was the unsung team leader began with Bill Dickey. He set the standard for legendary New York Yankees catchers, directly teaching two generations of Yankee backstops. Much like his career that is sometimes overshadowed by his legendary teammates, the top Bill Dickey card list compiles his best options, many of which are overlooked appearances in some of the most legendary sets in baseball card history. 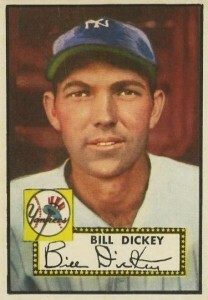 Shop for Bill Dickey Cards on eBay. 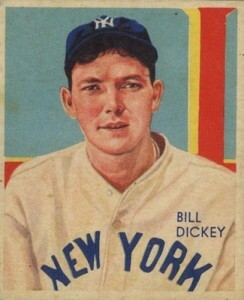 Bill Dickey played professional baseball from 1928 to 1943 and was part of eight World Series title teams with the Yankees. In 1949, Dickey returned to the Yankees as a first base coach and served as a mentor to Yogi Berra. Berra even took Dickey's #8 and when the Yankees retired the number, they did it in honor of both players. 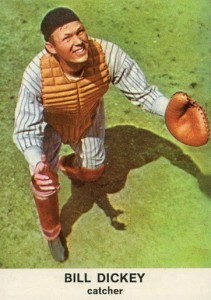 Dickey also taught the art of catching to Berra's replacement, Elston Howard. Bill Dickey added six more championships during his years as a manager and coach, giving him a jaw-dropping 14 titles over his baseball career. Known as one of the toughest players of his day, Bill Dickey set a record by catching more than 100 games in a season for 13 straight years. Dickey did not confine himself to the diamond and even made a few appearances in movies. Eagle-eyed viewers of the Lou Gehrig biography The Pride of the Yankees will notice that Dickey plays himself. Bill Dickey has quite a few cards that are noteworthy but weren't included in the list for one reason or another. His earliest cards came in a few 1931 sets that are very rare. Collectors looking for additional Dickey appearances during his playing days can try to find his 1933 US Carmel set appearance or several other 1933 releases. 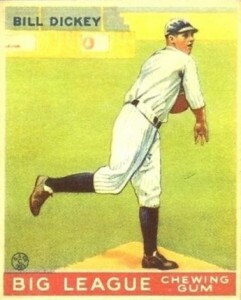 Many years later, in 1960 Topps, Dickey was included on the Yankees' coaches card. A multi-piece relic card holds a place in the top ten, but collectors searching for more memorabilia options can look to 2001 Topps Tribute for relics honoring his retired jersey (#8). In the massive Upper Deck 2008 Yankee Stadium Legacy insert set, you can find many Dickey cards included from his playing and coaching days. In recent years, Dickey has also made regular appearances in the Panini Cooperstown sets. Distilling a player's baseball card appearances into a top list can be difficult at times, especially when their early appearances are in the most sought-after sets from the 1930s. In constructing Dickey's list, consideration is given to the historical importance of some of his early cardboard appearances (as well as their value), while at the same time providing a variety to the list that is a hallmark of a strong collection. Bill's card from this little set put out by Golden Press gives collectors a nice starting point in building a collection. The set features only Hall of Fame members and was issued in a book with the cards perforated so that they could be easily separated. The beautiful card utilizes a colorized photo of Dickey during his playing days looking like he is trying to track down a pop-up. Collectors seeking an autographed Bill Dickey baseball card are mainly out of luck with just a few in-person or through-the-mail signatures being commonly available at auction. However, he does have quite a few multi-player relics in several recent high-end sets such as 2015 Panini Immaculate Collection. Dickey shares this card with contemporaries Luke Appling, Ken Boyer, and Herb Pennock. 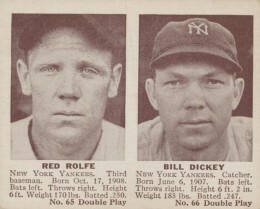 Dickey shares his 1941 Double Play card with Red Rolfe who played third base for the Yankees on five World Series-winning teams. Although this card can reach triple digits in value, the previous card in the set, #63-#64, features Joe DiMaggio and near-mint copies can command nearly a thousand dollars at auction. Bill Dickey looks just as young as he did in his card appearances from a decade earlier and so it appears that Topps used an earlier photo for this 1952 Topps card. The last series from the set was only available in a few areas around the country and his short-printed #400 trails only the Eddie Mathews rookie card in value. 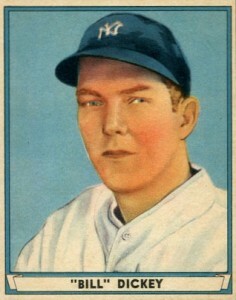 Although he has a card from the 1940 Play Ball set, Dickey's 1941 Play Ball appearance makes the list instead because it is essentially the same card as the earlier issue, but this time in full color. There are only 72 cards in Play Ball's final set, with the last three cards on the checklist being reserved for Yankees (Dickey, Joe DiMaggio, and Lefty Gomez). Those three cards are some of the most valuable options in the release. Put out over the course of three years by the National Chicle Gum Company, there are many variations in the 1934-36 Diamond Stars set. Bill Dickey's cards can be found with information from either 1934 or 1935 on the reverse. If the colorful design looks familiar to you, it may be because it was also used in the 2010 Topps National Chicle set. Without question, Dickey's 1951 Bowman card is one of a kind. 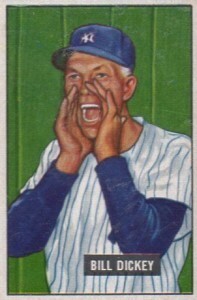 In a set filled with traditional painted images of players smiling at the camera or holding a bat, Dickey is yelling at a player, something he certainly did on a regular basis as first base coach for the Yankees. Although the set features black-and-white cards, the photography included in the 1939 Play Ball set is some of the greatest ever to that point. 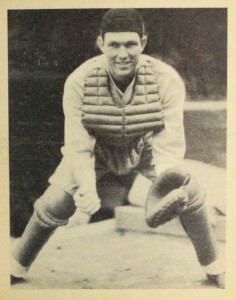 The Bill Dickey card shows him in his full catcher's gear, minus his helmet, waiting for a throw to the plate. 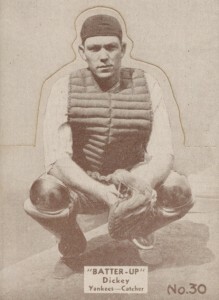 While there are several variations of the lettering on the backs of these cards, all versions contain the players full name and "William Malcolm Dickey" appears on the back of his. National Chicle, the same company that issued the Diamond Stars set (#5 on the list), also created the Batter-Up set. These cards were designed to be folded so that the player would seem to pop out from the rest of the card. Consequently, pristine versions of this card are very rare. Dickey's expression makes him look as tough as his reputation says he was. Taking a quick glance at Bill Dickey's 1933 Goudey card, you might expect that he was a pitcher rather than a catcher unless you noticed his catcher's mitt sticking out under his arm. 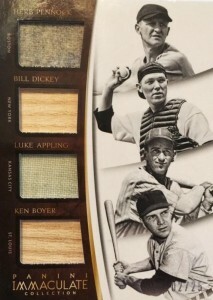 The 1933 set was the first issued by the Goudey Gum Company and is arguably the most famous pre-World War II set. Even rough copies of this card can go for several hundred dollars. 1941	Playball	Bill	Dickey	70	PSA 8	Yankees	Looks 9!!!!! 1934-36 Diamond Stars #11 Bill Dickey Yankees HOF PSA 2mk ! !